A VPN server is always good to have, whether you are looking to stay safe on a public WiFi hotspot, or avoiding overly restrictive web filtering, and you likely already have a VPN server in your router. Best of all, it is free to run your own server, and you don't have to trust any additional 3rd parties with your web traffic. While this tip can apply to any device running android, windows, linux, or Mac OS. For this post, we will focus on android smartphones. While you can use a VPN server without a dynamic DNS service, If your ISP does not provide you with a static WAN IP (nearly all residential ISP services do not give you a static IP), then a dynamic DNS service can be added into the Dynamic DNS page on your router (Linksys routers will list it as DDNS). The dynamic DNS service will allow you to have a fixed DNS address that will always be directed to your WAN IP address whenever it changes. In the web UI of most modern mid range and above routers, you will a VPN service setting in the advanced settings menu. On Linksys routers, I is located on the main page under OpenVPN Server. 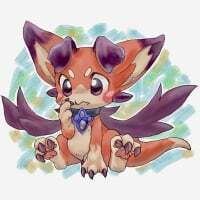 I will provide more detailed instructions for Netgear routers, though the steps are similar for pretty much all consumer routers that offer a VPN server. 1: Head to your router page (often 192.168.1.1 or 192.168.0.1 depending on the router). 2: After logging in, head to the Advanced tab. 3: Click on Advanced Setup. 4: Click on VPN Service. 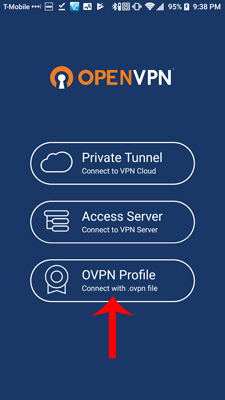 5: For the section that says "Clients will use this VPN connection to access ", set it to All sites on the Internet & Home Network. 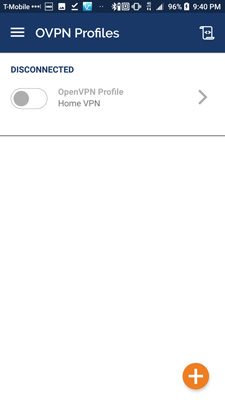 6: Check the box next to "Enable VPN Service". 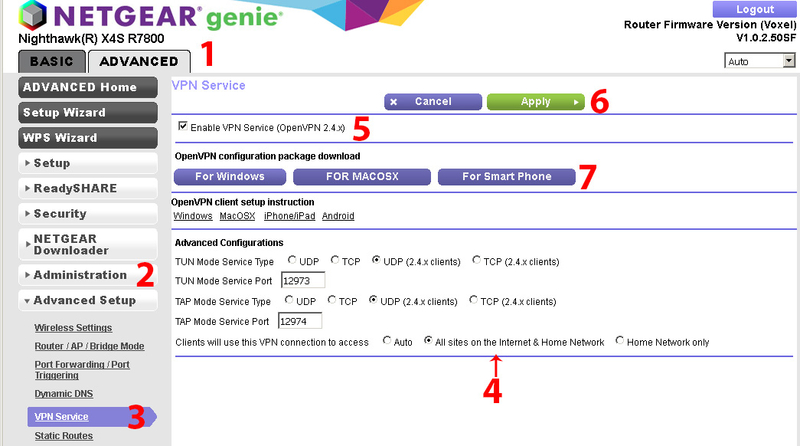 8: Under the section labeled OpenVPN configuration package download, click on "For Smart Phone". This will download the VPN config file as a .zip package. You will have to unzip it before you can use it on your smartphone. It is just a single file with the name "smart_phone.ovpn". Once that file is copied to your phone, we can perform the client setup on the smartphone. 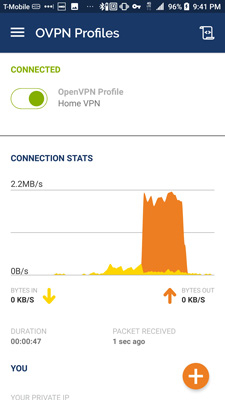 3: Click on "OVPN Profile. 4: Find the smart_phone.ovpn file that you saved to your smartphone, and then click on it (the text should turn orange). 5: After you have selected the file, click on import. 6: Give the profile a name if you want (you can name it anything you want). 7: You are now ready to connect to your VPN server. Simply click on the toggle to the left of the profile you just imported, and it will connect to the VPN server. PS, the server can only be reached from the WAN, thus you have to be on a different network or on LTE. 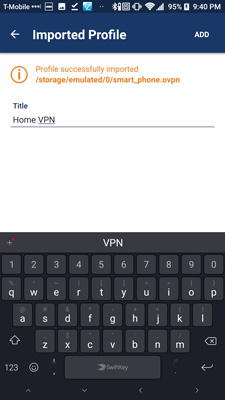 While connected to the VPN server, you will have access to both the internet, as well as local resources from you home network. I especially like the local access as when traveling, I can stream videos saved on my NAS. Another benefit is getting around web filters on some hotspots where certain websites or services may be blocked, this is in addition to preventing your traffic from being spied upon by whoever is running the hotspot. Finally, if traveling, a VPN can be useful for accessing web content that is restricted to your home country. This is an area where running your own VPN server is far better than using any of the paid services. Services like netflix are constantly taking steps to block popular paid VPN services (e.g., private internet access), many public forums will also instantly ban accounts if spotted behind some shared VPN servers (as trolls and spammers tend to use them to get around IP bans). By running your own server, you can be sure that no service or website will have your IP blacklisted (unless you use your home connection and WAN IP to troll and spam). With all this in mind, using your own VPN server can allow you to do things like access the US Netflix library while you are in Australia. Furthermore, running your own VPN server, will allow you to access resources on your home LAN, such as your NAS, IP cameras, and various other network devices, all without having to expose those devices directly to the WAN. For example, since IP camera makers rarely release firmware updates, I do not like to give them access to the WAN, but I can still access them remotely by first connecting to my VPN, and then proceeding to connect to those devices. It also works well for streaming media from my NAS at home, while I am on the go.